You know what we haven't had around here for a long time? NEW COUNTIES, that's what! But fortunately, Mrs.5000 and myself have just returned from a two-week odyssey by land, air, and sea. It was a trip on which we saw many beautiful landscapes, visited many wonderful people, and visited three of the great world treasuries of art. But you don't want to hear about that. You want to hear about the statistics! 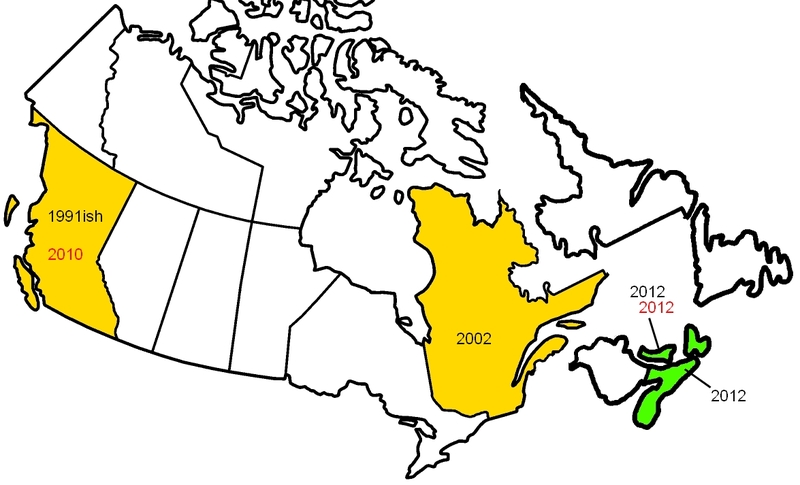 I'll start with my brand-new Canada map, so new in fact that it doesn't exist yet. There we go. Certain liberties of scale taken for purposes of legibility. 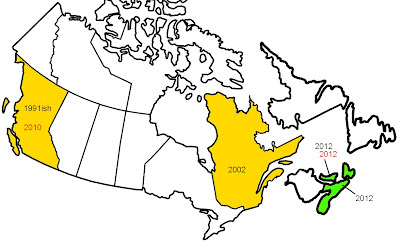 Canada: In addition to the lovely province of Quebec, I was able to visit my third and fourth Canadian provinces, Prince Edward Island and Nova Scotia. Canada being the "place" -- broadly speaking -- where I first had the idea of keeping track of running on the road, it's fitting that I was also able to run my second province -- 3.48 miles was my all-time longest run in PEI, and my second-longest ever run in the nation of Canada! Maine: We were repatriated into Acadia National Park, which meant my first new county in slightly over a year. But perhaps I should explain for any newcomers that I have long kept track of my travels by county; on the above map red counties are those I first visited between 1992 and 1999, blue between 1999 and 2003, and dark green from 2003 to 2010. The bright green are the new 'uns. I can't really recommend county collecting highly enough. It really encourages you to take roads less traveled, which gives you a real sense of what the country is like and how people live off of the interstates. Also, of course, it lets you thoroughly geek out on data. For instance, I can tell you that my fifth Maine county makes that state 31.5% complete, vaulting it over Iowa, Arkansas, and Minnesota to become my 29th most explored state. Maine had also been the 12th-since-last-visited state, but we took care of that and how! New Hampshire: One new county makes New Hampshire 80% complete, the 10th most-explored state! Vermont: Some aggressive and delightful road-tripping through five new counties in the loveliest of the 50 states brought it to 93% complete, which was a leap from the 15th to the 7th most-explored state! Connecticut: Lots of excitement here, as my collection of three new counties finished off the state! 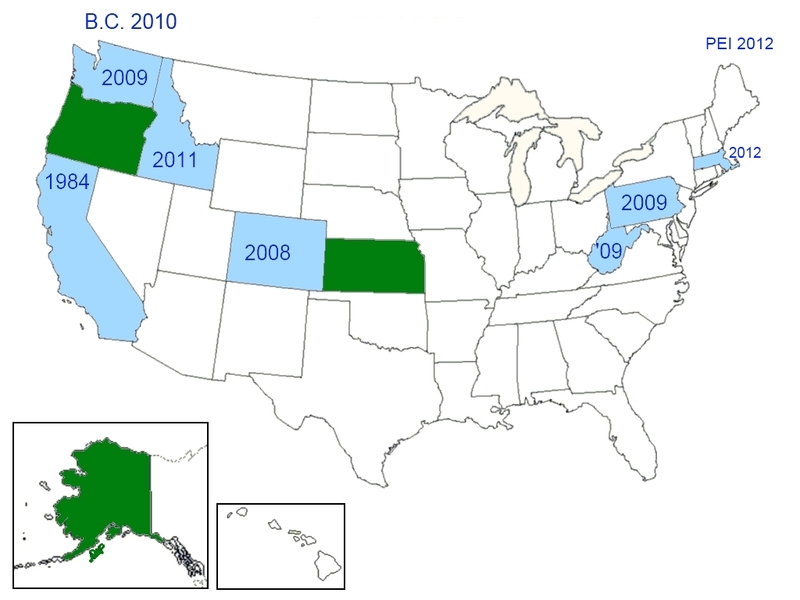 Connecticut now becomes my sixth complete state, following in the footsteps of Oregon (1993), Kansas (1998), neighboring Rhode Island (2002), Washington (2004), and neighboring Massachusetts (2005). w00t! With 10 new counties from this trip, my grand total stands at 1023, about a third of the national total. In answer to the almost inevitable follow-up question, no, of course I don't intend to complete the collection. New York: New York is terrific, and the island of Manhattan continues to unfailingly defy all its stereotypes, for instance by being among the uniformly friendliest places I've ever had the pleasure to visit. Lamentably, there was no new statistical action this trip. Rhode Island: Nor was there in Rhode Island, although we did take a slightly longer route just in order to go through it. It is amusing to drive through Rhode Island. It is very small. Massachusetts: We ended the trip in this fair state, and although there is no longer any room for county-grabbing -- Massachusetts is one of my complete states -- I was finally healthy enough to make it my 10th ran-in state. And then the next day I broke my all-time Massachusetts distance record (5.12 miles) with a run of 5.35 miles. Clearly, there's lots of room to grow here. You know what else we haven't had around here for a long time? Dorkfest, that's what. Stand by. What are the colors on the running map? Oh, green is just the states I've lived in, and so have run in quite a bit.